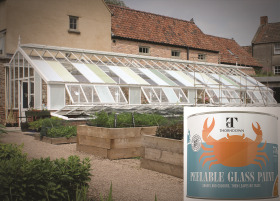 Thorndown’s Peelable Glass Paint is a unique, revolutionary eco-paint that can be painted on glass or other hard shiny surfaces and simply peeled off cleanly when no longer required. Made from a 100% recycled plastic resin, the coating is very durable and water-repellent but has an elasticity that enables it to be peeled off. Originally designed as a greenhouse shading product, it can also be used for conservatory shading, numerous commercial uses, arts & crafts, and an all-round decorative paint. The range has 38 standard colours; 24 opaque solid shades and 14 transparent stained-glass colours using exterior grade colour pigments that are UV resistant and VOC free. This glass paint can be applied by brush, roller or sprayer and can be used internally and externally. it is very durable, can be easily cleaned and lasts for years, but when you want to remove it - it simply peels off in one sheet.